Kangaderoo Custom QR Code. : QRbuntu. Quote from the movie TRON: Legacy: "and most secure operating system is out there for free!" Ubuntu is the Linux alternative for your desktop OS. What else can be said about Ubuntu? It's still not the mainstream OS for desktop devices, but the internet backbone holds quite some Ubuntu operated servers. And Ubuntu is going mobile! This raises the question; do we really need another mobile OS? Looking at the way Ubuntu proposes to implement their operating system to really integrate mobile/desktop/server could be worth while. Modern smartphones pack a lot of calculating power. The power of these smartphone exceeds the desktops of a couple of years back. It is a nice thought of just docking the smartphone in a cradle that connects it to a monitor, keyboard and mouse; and voila there is your workstation. No need to synchronize mail clients, schedules, contacts, since it is all in one device. Want to develop your Apps? The development environment is already on your system, no need to have a virtual environment for debugging. 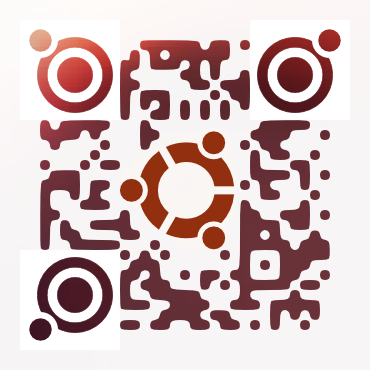 One of the currently existing apps is a QR Code Reader, I just hope the code attached to this article scans with an Ubuntu phone, feedback is appreciated! One of the mayor pluses of Ubuntu is that mayor release updates don't always require more powerful hardware. If they can offer this feature with their mobile OS, they will have exceeded the Windows mobile OS in my opinion. Meanwhile I will hold on to my Windows Mobile 7 Nokia Lumia, you know the one that cannot run WM8, and keep an sharp eye out for the Ubuntu phone. Did I mention that the OS itself is free?